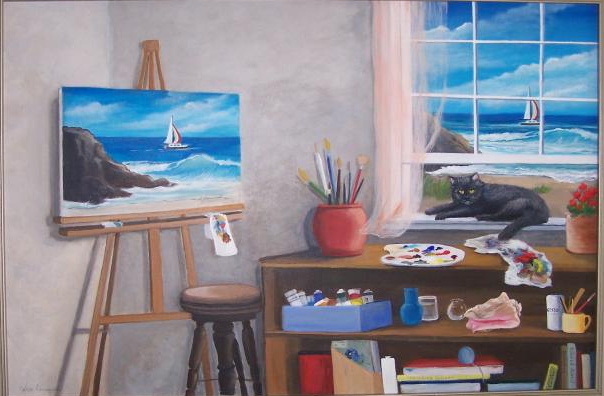 This month the Showcase of Fine Art II is featuring Linda Novakovich in a show titled "Down by the Sea". Linda has been painting for many years, especially since she retired from the B.L.M. in 2007. She has been faithfully attending classes taught by Letha Mitchell at Ye Olde Art Shoppe since then. She has many beautiful works on display from May 3rd - May 29th with an artist reception on Saturday, May 8th from 10am-1pm. Everyone is encouraged to attend. Meet Linda and have some snacks. Enjoy a few hours with an exceptional artist and meet more. If you have any questions or comments please contact us.